When the Swiss monetary authorities established a cap for their currency against the Euro in order to prevent it from appreciating against the Single Currency in a manner that would threaten Swiss exports, at the height of the global financial crisis, when all the free cash in the world sought a safe haven, they earned the disapproval of Forex dealers everywhere for effectively taking the franc out of contention as a trading currency. But when they removed the cap, as to maintain it was proving too expensive in terms of Swiss foreign exchange assets, particularly in light of the effects of Euro zone Quantitative Easing, they caused an explosion on Foreign Exchange markets that is still felt. See the chart above for an idea of how dramatic the strengthening of the Swiss currency was on that occasion (a fall in EURCHF indicates a strengthening franc). 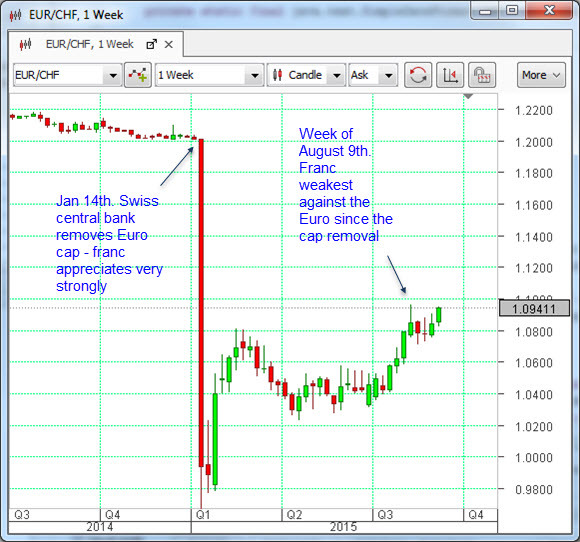 Now the Swissy (EURCHF) is clawing its way back towards the levels that pertained before the cap was removed. This must be sincerely welcomed in Zurich. 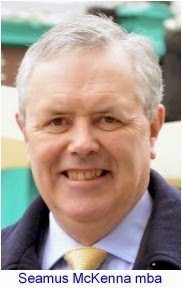 It is, apparently, due to the new position in which the Euro finds itself, as a safe haven itself, and as a funding currency for the international Carry Trade (when interest rates are low, as they are in the Euro zone, institutions will borrow in the currency of the low interest rate jurisdiction to effectively loan it out in those countries where rates are high, or are expected to be high in the future). But QE in the Eurozone has not gone away. In fact there is every reason to believe that it may be added to in the future, and no matter how resilient the Single Currency has proved to be, its long-term prognosis is for a weakening bias. In the meantime, Switzerland is still the super-attractive economy it has always been. It enjoys a solid, rigidly sustained unemployment rate of 3.3%. Its industry is amazing, in that even with the very strong franc that pertains at present, exports are still up marginally. Bookings for winter holidays, especially from Germany, are still buoyant in spite of fears that this market would dry up because of the franc appreciation. Deflation has also reared its ugly head in the Helvetic Republic. Recent Swiss consumer prices had their sharpest fall in 56 years. But Switzerland does not have the capacity to engage in QE in order to combat this, which might tend to weaken the franc, as its bond market is small relative to its global Foreign Exchange counterparts. The Swiss economic drama continues.